This was a song I had PLANNED to sing today and we never got to it. Who could ask for anything more? There’s a spider on the floor, on the floor. And it’s really, really big. There’s a spider on my leg, on my leg. Oh, he’s just a dumb old lummox. There’s a spider on my stomach, on my stomach. Oh, I’m gonna be a wreck. There’s a spider on my neck, on my neck. Oh, I wish that I were dead. There’s a spider on my head, on my head. Yesterday was SUPER busy and tomorrow will be CRAZY with our Halloween Party so today we slowed down a little today. 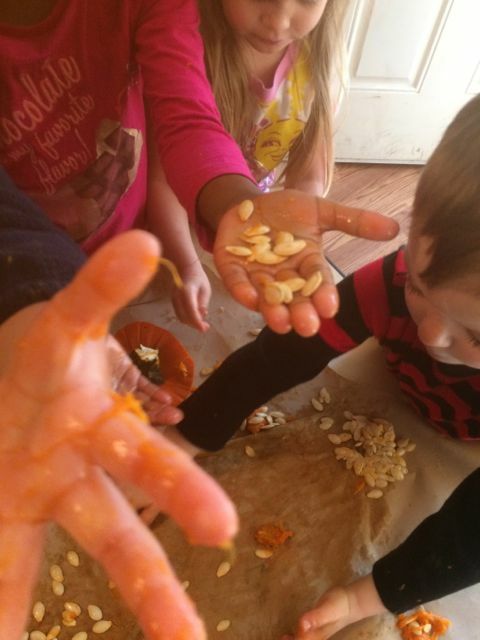 We opened a pumpkin and explored the inside. The kids enjoyed sticking their hands inside. 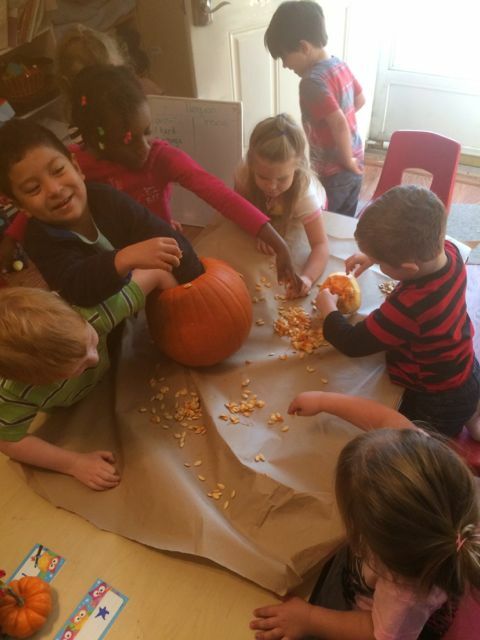 Remember yesterday we charted their observations about the outside of the pumpkin. As the children had their hands in the gooey mess one of them took over . 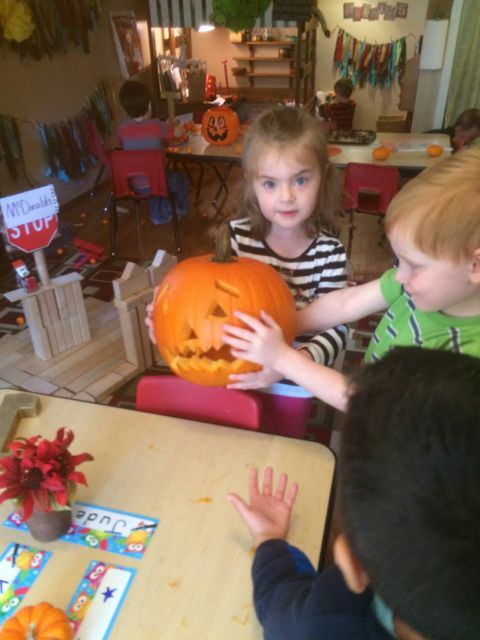 ” Canyon what do you feel inside the pumpkin? Chandler what do you see ? How do you describe it ?” My hands were a mess too so I called Ms Dallas to come transcribe that they were saying. This went on for a long time and they made a long list of adjectives to describe the inside of the pumpkin. Hmmpf. Who needs a teacher ? After gutting the pumpkin we decided to turn it onto a jack-o-lantern. 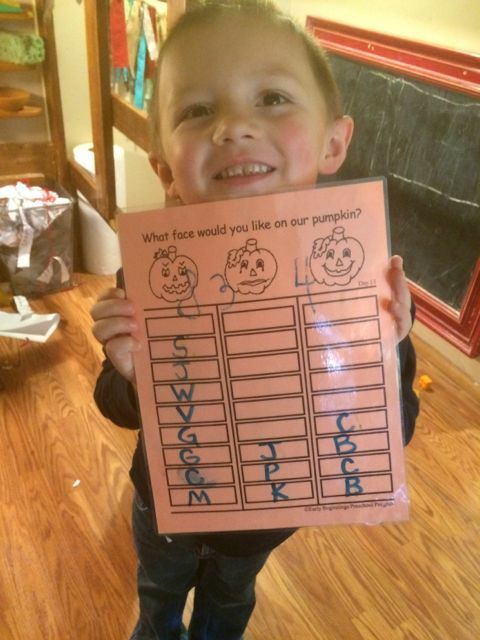 We voted on what kind of face we should make on the jack-o-lantern and they decided SCARY was perfect. I can help my family !